Spaghetti Bolognese has been a favourite meal for many decades but the days of emptying a packet of power onto a pound of minced beef and serving it with grated cheddar cheese are long gone. These days there are many ways to serve the dish depending on what foods are favoured by the family it is being served to. With the introduction of Quorn and other meat substitutes and soya based products onto our food shelves it is possible for non meat eaters to be served meals which look exactly like a meat dish. Spaghetti Bolognese is one of those recipes that lends itself readily to this treatment. It is possible to serve spaghetti Bolognese as part of a low fat diet. Use only lean beef, or a meat substitute. Replace cooking oil with a low calorie spray when cooking off the minced beef and onions. 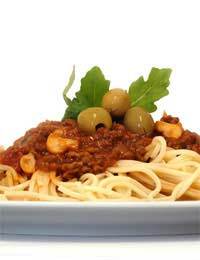 Instead of purchasing a ready-made jar of Bolognese sauce use canned or fresh tomatoes and thicken with tomato paste. Either use parmesan cheese sparingly or replace with a grated low fat cheese and a sprinkling of mustard powder to spice it up. Try to add more interest to your spaghetti sauce by adding interesting vegetables and pulses. Your sauce could easily hide many of the day’s vegetable requirements and your children would be none the wiser! This recipe will resemble a thick stew that can simmer in the oven or slow cooker all day so that all you need do is cook some spaghetti and serve. Heat the oil in a large heavy based pan. Add the chopped onion, garlic, bacon and minced beef. Do not have the heat too hot or the meat will burn. At the same time put the lentils into a small pan cover with water bring to the boil and simmer for ten minutes until soft. Once the meat is browned add the two cans of chopped tomato, the carrot, red pepper, herbs, tomato paste, stock cube and red wine. Bring to simmering point and add the drained lentils. At this stage you can either leave to simmer or transfer to a slow cooker or a low oven and leave to stew for a few hours or for the day if you wish. When you are nearly ready to serve your meal put a large pan of water on to boil. Season and add a little olive oil. Place your spaghetti into the pan of boiling water and cook until the spaghetti is just tender or al dente as the Italians would say. While the spaghetti is cooking remove the sauce from the oven and add the button mushrooms and the freshly quartered tomatoes. These two ingredients will not be overcooked and add interest to the finished meal. If you require your spaghetti sauce to be a little thicker add another tablespoon of tomato paste or gravy granules until it is to your liking. Drain the spaghetti and place in a large serving bowl. Pour over the sauce and mix together before serving with a dish of parmesan cheese for your family to add as they wish.